If it has always been your dream to fly to an exotic foreign locale in an airplane decorated by Smurfs, have we got good news for you. Brussels Airlines has inaugurated the latest plane to be added to its Belgian Icons fleet. 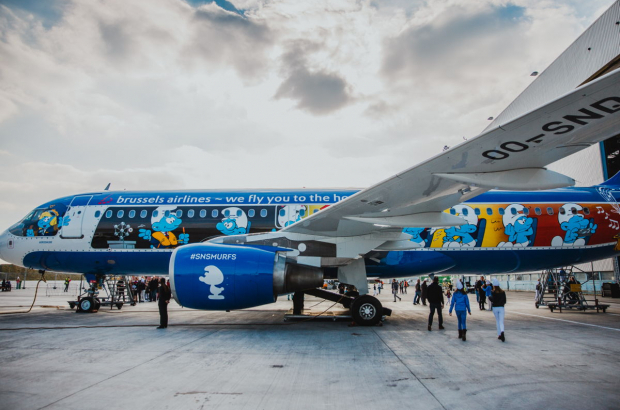 The plane is decorated with the little blue figures created by Brussels cartoonist Pierre Culliford – better known by his pen name Peyo – in 1958. That’s exactly 60 years ago, and Brussels Airlines has unveiled the design in time for the anniversary celebrations. The airline held a design contest for the A320 aircraft, heretofore known as Aerosmurf, which was won by Marta Mascellani, a student from Milan. She knew about the contest because her brother is a pilot with Brussels Airlines. The design includes Harmony Smurf playing the saxophone – a Belgian invention – and another Smurf playing the harmonica, a reference to Toots Thielemans. On the crew Smurf’s trolley perches a miniature Atomium, while another serves Belgian fries and waffles to Smurf passengers. There are four other designs in the airline’s Belgian Icons fleet of planes: Tomorrowland, Tintin, Magritte and the Red Devils. The Smurf 60th anniversary celebrations also include a new mural in the centre of Brussels and special honours on Belgian National Day, the 20k of Brussels and the Memorial Van Damme. A surprise is being planned for Grand’Place, and an interactive exhibition is being staged at Brussels Expo.